Dramatically narrated case histories from Justice Ginsburg's stellar career are interwoven with an account of RBG’s life - childhood, family, beliefs, education, marriage, legal and judicial career, children, and achievements - and her many faceted personality is captured. The cases described, many involving young people, demonstrate her passionate concern for gender equality, fairness, and our constitutional rights. Notes, bibliography, index. 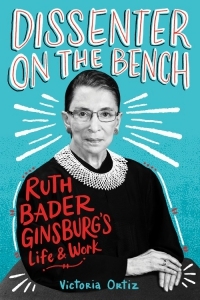 The life and career of the fiercely principled Supreme Court Justice, now a popular icon, with dramatic accounts of her landmark cases that moved the needle on legal protection of human rights, illustrated with black and white archival photographs.